A skeptical scientist, an earnest teenage girl, a danger filled mission! Disney returns to the classic sci-fi thrills of yesteryear with an updated twist in Tomorrowland, coming to theaters this summer. The brand new full-length trailer is dropping this Monday, March 9! But before then, we have the final pay-off poster for this exciting adventure, which finds a young boy being tracked through the wheat fields by George Clooney as they make their way towards the futuristic city landscape of Tomorrowland! From Disney comes two-time Oscar winner Brad Bird's riveting, mystery adventure. 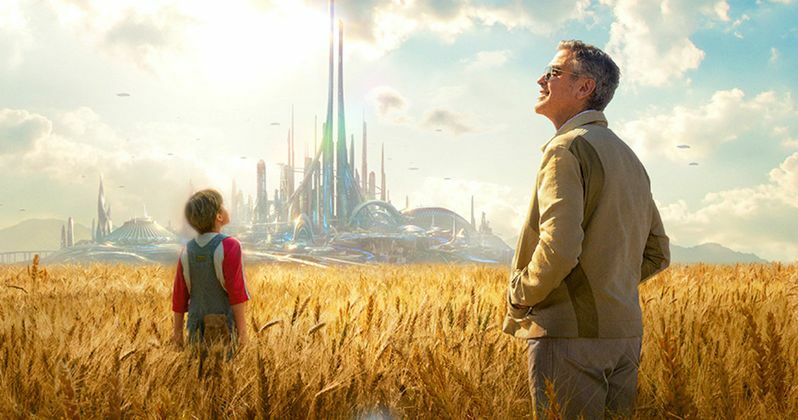 Bound by a shared destiny, former boy-genius Frank (George Clooney), jaded by disillusionment, and Casey (Britt Robertson), a bright, optimistic teen bursting with scientific curiosity, embark on a danger-filled mission to unearth the secrets of an enigmatic place somewhere in time and space known only as Tomorrowland. What they must do there changes the world-and them-forever.